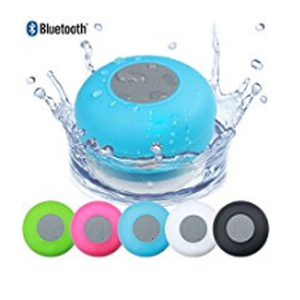 Amazon selling SeCro Waterproof Wireless Bluetooth Shower Speaker Rs. 380 only. INCREDIBLE SOUND ANYWHERE: Don’t let the water stop you from enjoying your favorite music! Guppy is the Perfect Companion for the beach, camping, poolside, exercising, paddleboarding, on a boat, shower or bathtub, kitchen, or just about anywhere you want your music to go. HOURS OF AMAZING SOUND: Our high quality speaker driver and Bluetooth audio wireless connectivity gives you seamless streaming, quick charging, 6 hours of playtime, sound so good you won’t believe it’s coming out of a speaker that is so lightweight! EXCLUSIVE ACCESSORIES: Are you tired of hunting for that strange charging cable the other shower speaker brands give you? Are you worried their weak suction cup is going to let your speaker fall? DON’T WORRY! We include an INDUSTRY STANDARD micro USB cable so you can easily charge your speaker. HIGHLY WATER RESISTANT: Our tough, durable, and waterproof silicone housing and charging port cover means that you don’t have to worry about splashing, bumping, or spills, making it perfect for both outdoor and indoor use. It’s also highly KID-PROOF!